Catalyst Arts is a non-profit and a members-based arts organisation to whom the present committee are responsible to. Catalyst Arts was formed 17 years ago in response to what was seen as a cultural vacuum. It is Belfast’s primary artist-led organisation. In accordance with its constitution it is run by unpaid volunteers, and seeks a dynamic program of exhibitions, events, workshops, performance in the widest possible range of disciplines by large selection of artists both within and without the Gallery. The Curfew Tower is the centre of the village of Cushendall. It was built by then landlord of the town, Francis Turnley, in 1817, to confine riotous prisoners. In more recent history the Tower has been turned into an artists retreat (confining riotous artist!). A place artists can come and take some time out to create work. 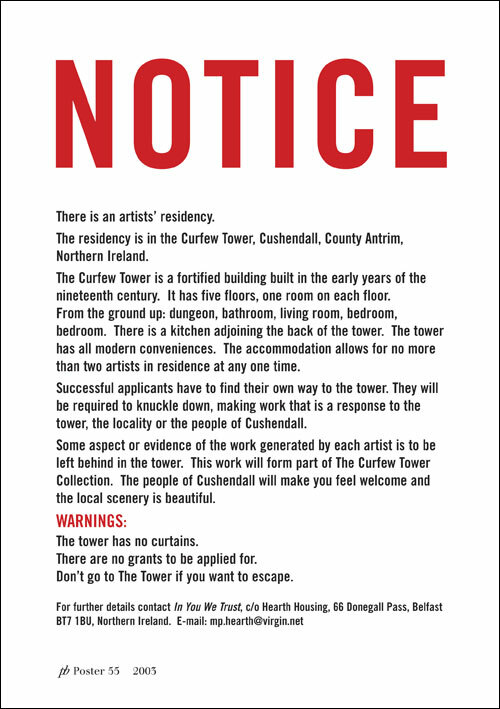 In 2009 Catalyst Arts was asked to curate the Curfew Tower in the full year of 2010. As part of and in the sprit of that collaboration we at catalyst have set up this Blog so the artists process’ can seen and the artists and the residences can be more transparent. Bringing Cushendall and the artists in the Tower closer to you….